This year we’ve seen some very exciting and historic firsts here at Ingersoll; from the introduction of full time staff providing direct one on one support to the TGNC community, to the unveiling of our Community Financial Assistance Program, which helps us provide financial support to the TGNC community for amending ID documents, gender affirming clothing, as well as emergency HRT. Ingersoll Gender Center is ever growing and expanding it’s programs and the ways in which we show up for our community. One of the biggest issues facing our community, is access to gender affirming healthcare. For many of us, going to the doctor presents us with very real fears, anxiety, and burden. We wonder how medical providers will treat us, if they will know how to treat the unique challenges we face, and if the services and treatments we need will be covered or denied based solely on our identity. But what does it look like to envision a standard of care that treats us as whole people with trans healthcare being a standard in healthcare provision? What does it look like to have a say in what healthcare access for transgender and gender nonconforming communities should look like? Ingersoll Gender Center is taking pause to bring together community leaders and community led non-profits to think bigger and broader, to build a bold vision for what our communities want their healthcare access to look like. 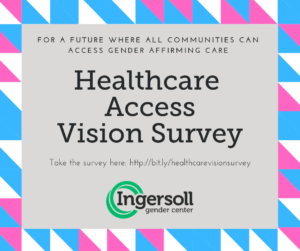 Together we aim to create an expansive vision for what healthcare access for transgender and gender nonconforming communities should look like that is driven by community and acts as a centering and prioritizing agenda for Ingersoll’s healthcare access work for the foreseeable future. Our advisory committee is comprised of some of the most dedicated community leaders. Their life experience and knowledge of healthcare and has paved the way for many in our community. LL Gimeno of QTPOC Birthwerks, Adrianne Tunney who was a King County Public Health Community Advisory Board member and who is currently a Social Work student, and Vanessa Grandberry a respected community elder as well as a Healthcare Educator at the Center for Multicultural Health. You can learn more about our advisory committee members here. Their input on this project has helped and will continue to help us create a broader vision for healthcare access, and so will yours! Have more questions or want to get more involved in this project? You can email me at mattie@ingersollgendercenter.org.